The Minimed Paradigm 722 insulin pump is a real-time system. An individual will be able to control and manage their diabetes better than before. When diet and exercise alone cannot control ones diabetes and they need insulin injections, this machine is for them. With an insulin pump, a person will have the freedom and privacy to manage their insulin like never before. The real-time options can assist a person in checking their blood sugar levels without pricking their finger. These selections monitor the glucose levels throughout the day. It can give up-to-date readings. When a person is beginning a new regiment with medicine and diet, checking blood sugar levels often is vital. However, the old fashioned way can be bothersome as well as painful. The Minimed Paradigm 722 system can relieve this problem. 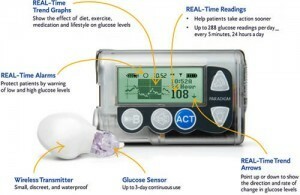 There are several benefits and features associated with this insulin pump. The product is small as well as lightweight. An individual will have no problem keeping the device hidden from view. The screen is easy to read, especially for individuals that have poor eyesight. This device monitors an individual’s blood sugar levels throughout the day. Every 5 minutes a new reading will appear. This will assist in being completely sure that the levels are in a safe range. The Minimed Paradigm 722 is equipped with graphs that allow a person to see which way the direction of the glucose is moving. This machine has a bolus calculator. The device will suggest the correct dose for a person’s unique settings as well as food intake. Alarms are present in this insulin pump. A person will know exactly when their medicine is running low, their battery is almost dead or when their settings are incorrect. The insulin pump can beep or vibrate. It is suggested that when an individual is sleeping, they use the beeping method. The machine checks for mistakes and has a safety feature that protects the individual throughout the day. This technique is constantly monitoring an individual’s system and will alert when a problem arises. The benefits for the Minimed Paradigm 722 are plentiful. An individual will be able to customize this machine to their personal style and personality. This machine can come in 4 colors. This will allow for originality and personal style. An individual can match their clothing, purse or even their beloved pet. A person will have the freedom to swim, shower or take a bath without concern that the machine will be ruined. This device can be immerged in water for up to 30 minutes. Batteries can be fairly expensive. However, the Minimed Paradigm 722 is rechargeable. With a full charge, the device can work for about 14-days non-stop. For added privacy, an individual can obtain a remote control. This option allows a person to change their setting without drawing attention to their insulin pump. An individual will receive 24 hours a day customer support. These individuals are trained professional willing to assist in any questions or concerns a person may have. Software services are available as well. An individual can use their PC to keep records and progress of their therapy. This is also an excellent method in showing an individual’s doctor reports each visit.